Automatic plastic strapping is designed to be used in arch type strapping machines. This type of plastic strap is produced from a higher grade plastic resin and is stronger than other grades of strapping. Boatman Marking offers plastic strapping as well as strapping machines. Automatic plastic strapping is designed to be used in arch type strapping machines. This type of plastic strap is produced from a higher grade resin and is stronger than other grades of strap. 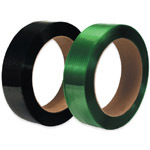 12mm strapping is commonly used in Strapex strapping machines for heavier items. At Boatman Marking we offer a wide variety of plastic strapping and strapping machines.